Online video games are fun but an internet connection isn't always available and sometimes you just want to play offline. 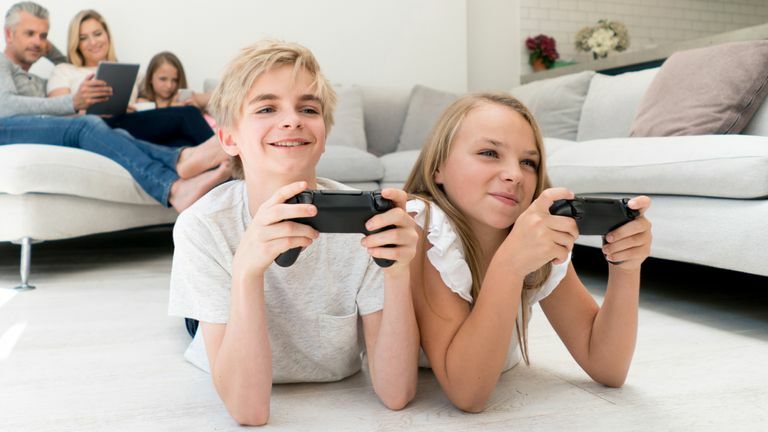 Offline video games can also be important for kids as they are a reliable way to protect children from being exposed to online bullying, harassment, and inappropriate content. Here are 10 of the most-fun video games that are just as much fun for kids to play offline as online. The Kinect motion sensor works perfectly for gameplay and menu navigation. Up to four players can play at once which makes is great for parties. Things can get out of control when players start moving their arms while on the menu screen and wrong items are selected. You need a large playing space for four players. Fruit Ninja Kinect 2 is the second motion-based spin-off from the popular Fruit Ninja mobile games. This rather ingenious game uses the Xbox One's Kinect sensor to scan players' bodies and then render digital shadows of them on the TV screen. Players must then chop, punch, and kick the air to move their shadows and destroy any fruit or weapons that fly towards them. A great visual style that replicates the anime look perfectly. A huge roster of Dragon Ball characters to play as. Experienced fighters may find this a bit too easy. Those new to Dragon Ball will have no idea what's going on. Dragon Ball FighterZ is without a doubt one of the best fighting games based on the popular Dragon Ball Z anime and manga series. The game boasts a 3D style that actually looks like the Japanese cartoon series and almost every character from the franchise that fans would want to play as are playable. Solo players will enjoy the story mode which features fully-voiced cutscenes while the two-player offline matches are great for local multiplayer gaming sessions. Large cast of playable characters. Four players can play at the same time. Some of the backgrounds get a bit repetitive after a while. Those who don't like the Cars movies or characters won't change their minds after playing this game. Everyone knows about the popular Super Mario Kart racing series but very few can think of another racing game that's also fun to play offline and supports four-player local multiplayer. Cars 3: Driven to Win fits the bill nicely with its split-screen multiplayer, solid game controls, and surprisingly impressive graphics for what could have been a cheap movie tie-in game. Cars 3: Driven to Win features 20 playable characters from the Disney Pixar Cars movie series, all of which can be customized. It also boasts six different game modes which will keep even the pickiest gamer entertained while playing offline. Up to four players can play at once. Some truly creative mini-games and uses of the Nintendo Switch. Would have been nice to have more players. Some games may seem too childish to older players. Super Mario Party is the first Mario Party video game for the Nintendo Switch console and it impresses. As with previous Mario Party titles, Super Mario Party takes the concept of a digital board game and adds as many bells and whistles as possible. In this case, that means adding over 80 new mini-games that can be played as the main game progresses and players move around the board. The entire game supports local two-player multiplayer. Over 200 playable characters from the Harry Potter movies to unlock. Graphics aren't as impressive as newer Lego video games. The Lego Harry Potter Collection is a rather impressive release as it contains both of the original Lego Harry Potter video games which in themselves contained story content from all eight Harry Potter movies. This means that kids will be able to play through the storylines of every single Harry Potter movie in one game without having to change disks or worry about losing progress. As with other Lego video games, Lego Harry Potter Collection uses humorous interpretations of the source materials characters and events which makes this a great entry into the franchise for younger gamers who may get too scared watching some of the later Harry Potter films. Great attention to detail in regards to the characters and attacks. Old-school fans will love the original actors' voices and theme music. Support for a fifth player would have been amazing given there are five rangers on the main team. Game can be pretty difficult for solo players. Saban’s Mighty Morphin Power Rangers: Mega Battle is the perfect video game for fans of the Mighty Morphin' Power Rangers TV series and movies. This purely offline kids game takes the popular Power Rangers characters from the first few seasons of the show and reimagines them as animated cartoon characters in a traditional 2.5 brawler. Players get to activate transformations between the characters' civilian and ranger forms, upgrade attacks, perform special team attacks, and even fight in giant Zords. Up to four people can play at once and players can jump in at any time to join in on the action. A fantastic re-release of three iconic games. Wonderfully voiced and designed magical creatures. Some of the controls still aren't as intuitive as other modern games. The Spyro Reignited Trilogy is a collection of the three classic Spyro video games, Spyro the Dragon, Spyro 2: Ripto's Rage!, and Spyro: Year of the Dragon. All three games have been given complete makeovers with new HD graphics and improved controls that reflect the standards expected in modern games. None of these games feature any sort of multiplayer but the single player content will keep solo gamers happy for a very long time. Fans of Skylanders, which spun-off from the Spyro video games, in particular will enjoy this collection. Support for two-player local co-op in all games. Optional motion controls with the Xbox One's Kinect. Character models look a little dated. 4K resolution on the Xbox One X doesn't impress as much as other games. Rush: A DisneyPixar Adventure is the perfect video game for the Disney Pixar fan in the family. This game invites players to visit a unique theme park that's dedicated entirely to Pixar movies and characters. Each part of the theme park features its own special mini-game relating to that movie with the Finding Dory and Cars areas sporting their own racing games while the Up and The Incredibles focus more on action and adventure. Over 164 levels to complete. Up to four players can play simultaneously. Experienced platformers will find the early levels to be too easy. No new levels for those who played all of the original on Wii U. New Super Mario Bros U was the perfect Super Mario platforming experience when it was released on the Wii U and New Super Mario Bros U Deluxe on the Nintendo Switch is even better. This re-release of the hit Wii U game comes with all of the content from the original, includes all of its additional content that was released digitally after its launch, and features new playable characters like Toadette who are designed to make the gameplay easier for younger players. Dance Central Spotlight actually teaches players the choreography for each routine. 4 difficulty levels for each song make dancing possible for all players. Only two players can play at the same time. Using the menu with motion controls takes some getting used to. When it comes to dancing games on the Xbox One, you really can't beat Dance Central Spotlight. While other dance games expect the player to just copy the music video on screen, Dance Central Spotlight allows for the song to be paused at any time and for specific moves to be looped and slowed down so they can be perfected. Something else that sets Dance Central Spotlight apart is the number of different choreography routines assigned to each song. Every song in the game's library has four versions of the same routine at varying difficulty levels plus four completely unique versions in different dance styles. This game isn't just a fun dance game, it's a dance teacher.